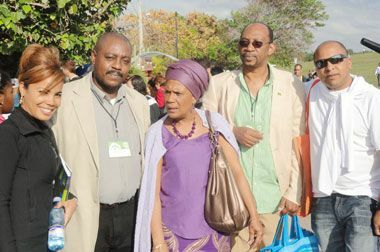 The St. Vincent and the Grenadines delegation to the fair was headed by Minister of Culture Frederick Stephenson, and included former minister RenÃ© Baptiste, book publisher Rhonda King and writer Dr. Edgar Adams. The St. Vincent and the Grenadines booth displays more than 80 titles by Vincentian authors, including the Spanish version of a history book titled Slavery, Law and Society in the British Windward Islands written by the late Vincentian historian Dr. Bernard Marshall. This book will be launched on Saturday, Febraury 19, by Ambassador Dexter Rose, with the presence of the authorâs son Stokely Marshall, nephew Curtis Robinson, who has painted a portrait of the author, and musician Ken Isles, who will entertain guests at the activity. One of the better sellers at the SVG stand has been the Making of the Comrade, the autobiographical work by Prime Minister Dr. Ralph Gonsalves, published by SFI Publishers. The publishing house Editorial Marti, which translated and printed the book by Dr. Marshall, has expressed interest in publishing Dr. Gonsalvesâ autobiography in a translated version for Latin American and Spanish speaking Caribbean readers. The fair, which in this twentieth edition is being dedicated to the cultures of the member nations of the ALBA member nations, opened on February 10 and runs to the 20th in Havana, before moving throughout all of Cubaâs 15 provinces. The Havana version, with participation from more than 100 nations by itself attracts over two million visitors over the ten day period.